B2B marketers have yet to fully embrace Pinterest; only one in four B2B marketers reportedly use the channel for content distribution. But the rationale for tip-toeing around the network is a detrimental self-fulfilling prophecy. Most people associate Pinterest with wedding planning, home decorating, design inspiration, and maybe some kittens here and there. A place for marketing that peddles jewelry, fashion, or some other female-buyer oriented consumer good. It’s not generally thought of as the place for sophisticated industry thought leadership content. This misconception — that Pinterest is not a viable channel for B2B marketing — needs to be re-examined and put to rest. To challenge this notion, B2B marketers need to stop thinking of Pinterest as a simple bulletin board and start thinking of it as your company’s whiteboard. When approached with an open marketing mind, it’s a social network where strategic thinking, data visualization, idea generation, and workplace inspiration come to life. On its very premise, Pinterest has major B2B marketing potential. Pinterest is a social network that allows users to visually share, curate, and discover new interests by posting or “pinning” images and videos to digital boards. And, believe it or not, some of your competitors are probably already using this channel right under your nose. The leading B2B companies on our most-stalked brands list, for example, are active on Pinterest, including IBM, Oracle, HP, Microsoft, Marketo, and Cisco. Now, if your response to this is, “But I don’t have enough visual content,” stop reading this and immediately reevaluate your content strategy. Because content is not king — content is a battlefield. If you have no visual content, then you are on the digital marketing front lines with no weapons. Infographics(! ): There might not be a better channel out there for infographics than Pinterest. Pinterest is optimized for long, tall graphics, and they look darned impressive when they are all pinned together on a board. Blog posts: You (should) already have a healthy library of blog-style posts that you can aggregate together in a board by using their imagery as photo pins. Check out 7 Reasons Content Marketing Is Vital For Your B2B Business for more rationale for B2B content creation. Industry tips and tricks: Use text-over-image formatting to turn long-form tips and tricks articles into bite-sized pinnable images. Offline events: Create boards for your important industry events, where you are already creating and aggregating tons of visually oriented content! Inspiration: Whether this is fun quotes or ideas from other influencers in your industry, make sure you are repinning third party content and showcasing a little bit of personality in the process. But remember, when you are posting to Pinterest, the text is still just as important as the visual. Pinterest is highly optimized for search, both within the channel and from Google. 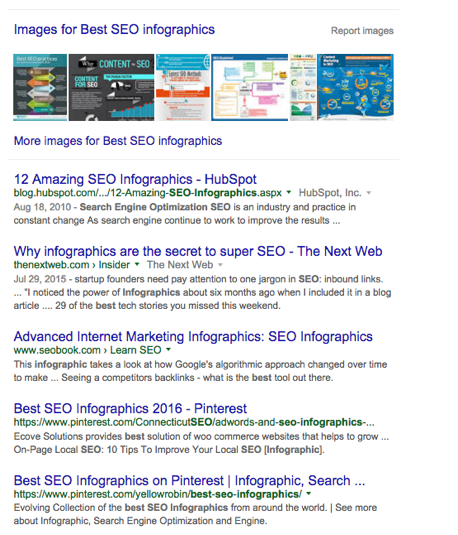 Just check out the below screenshot where two out of the top five organic results for “best SEO infographics” are from pinterest.com. If SEO is a key part of your digital marketing strategy, Pinterest is a very important social channel for you, whether you are a B2C brand or a B2B brand. Want to learn more about how Pinterest can integrate into your B2B marketing strategy? Want to optimize for Pinterest within your TrackMaven account? Reach out to your Customer Success Maven — we’d be glad to help! 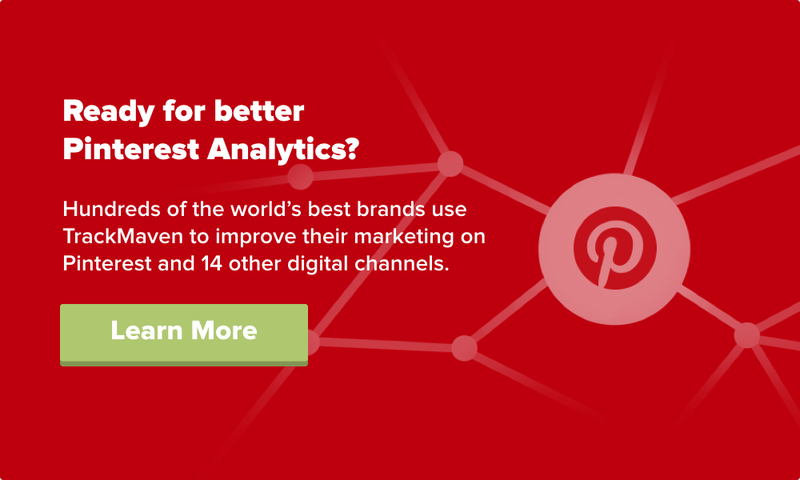 Or check out our guide to Pinterest analytics to learn how to track your Pinterest marketing efforts. Your marketing analytics advantage. Go from big data to big ideas. Fill out the form to learn how we can serve as your reporting and insights team. The latest research from CMI and Marketing Profs reveals best practices for B2B marketers. So what are the top content marketing trends?